A few days ago, under cover of a particularly stubborn fog blanket it was an ideal opportunity to get rid of all of the cuttings that had been languishing in a big heap at the bottom of our land for the last 9 months or so. 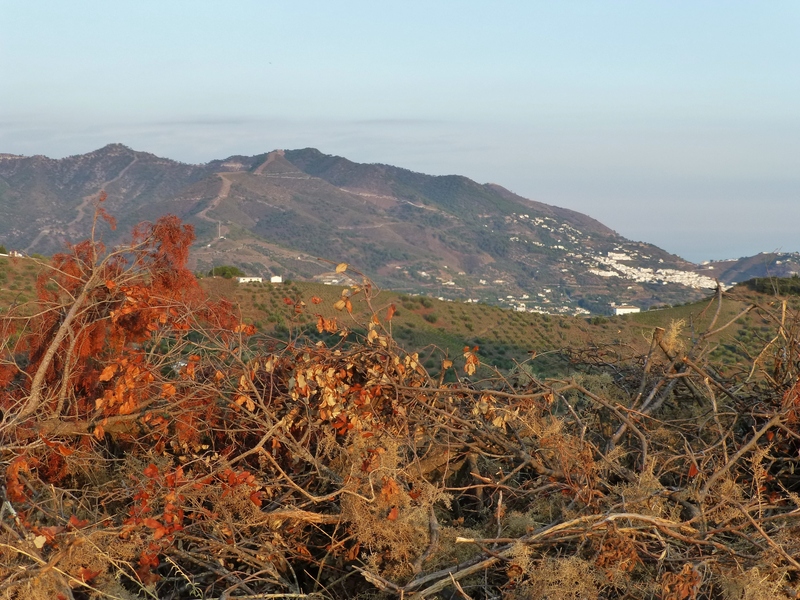 As I’ve written previously, the laws here are very strict (and open to wide interpretation) and it seems that even ‘out of season’ we would still need to obtain some sort of licence in order to burn anything being, as we are, so close to the Parque Natural. Despite the protests of the powers-that-be to the contrary, the fact that we are extranjeros (foreigners) does seem to have a bearing on any matter concerning permisos and leyes (laws). Anyway, although Joe’s fire was a rip-roaring success and soon reduced to a largish mound of ashes, the weather changed and by yesterday morning the ash mound, whipped up into a frenzy by the biting wind, achieved a renaissance. Bright sunlight heralded bad news; our cover was blown. The embers were now glowing red hot – all quite safe as the undergrowth was damp – however, the curling smoke could be a dead give-away to the ever-vigilant mountain lookouts. I didn’t want any more run-ins with the authorities so took it upon myself do something. I filled three 5 litre bottles with icy water and when I trundled down there the wind was such that I could barely stand, and everywhere I threw the water, the spread-out mound hissed malevolently. I repeated the operation three more times and it seemed to calm the mound. Then the light rain turned to horizontal snow. Towards the end of the evening, the fog and rain took over and the winds gained strength. I got up in the small hours and peered outside. It was pitch black, but down below me in the distance there it was, its glinting, glaring red eye staring back at me. It was still alive! For the rest of the night I got little sleep because the wind was so noisy and the cabin trembled. The next morning bright sunlight greeted us with not even the slightest puff of wind. I cautiously looked out at my nemesis. It had finally died. 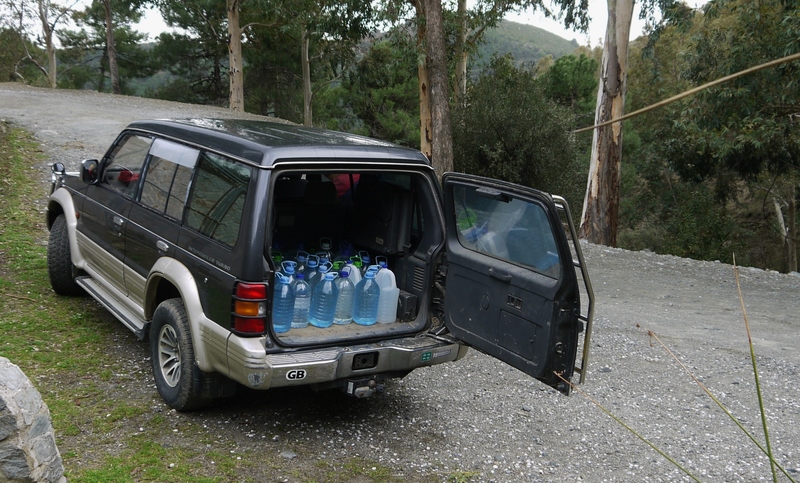 The only job of note to do today was to get water and there’s always a smug contentment in seeing the back of the car full of pure mountain water in 5 and 8 litre plastic bottles. And it didn’t cost us a centimo. I feel a bit embarrassed about the state of some of the bottles, so we’ll have to buy some more soon and use them ’til they start looking ragged. 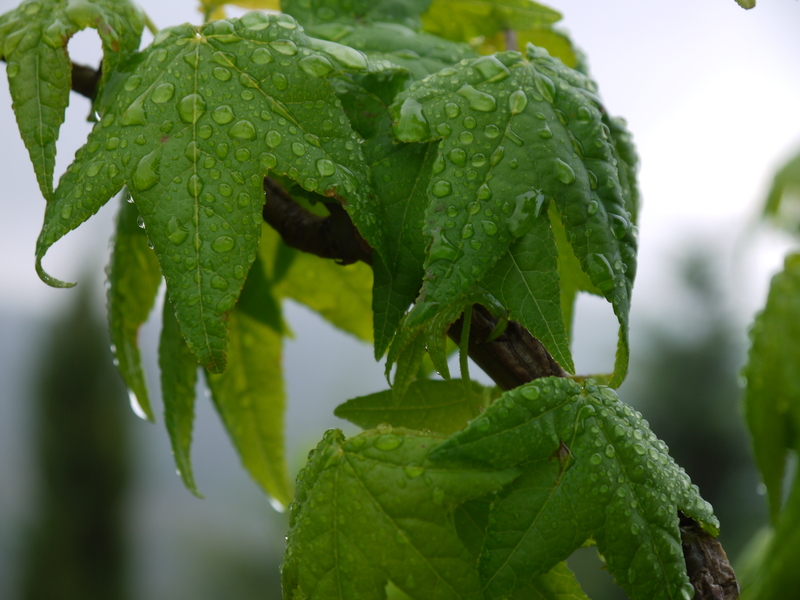 The rain settled in and we scurried back to the warmth of the log fire. Water is a commodity we can never take for granted. 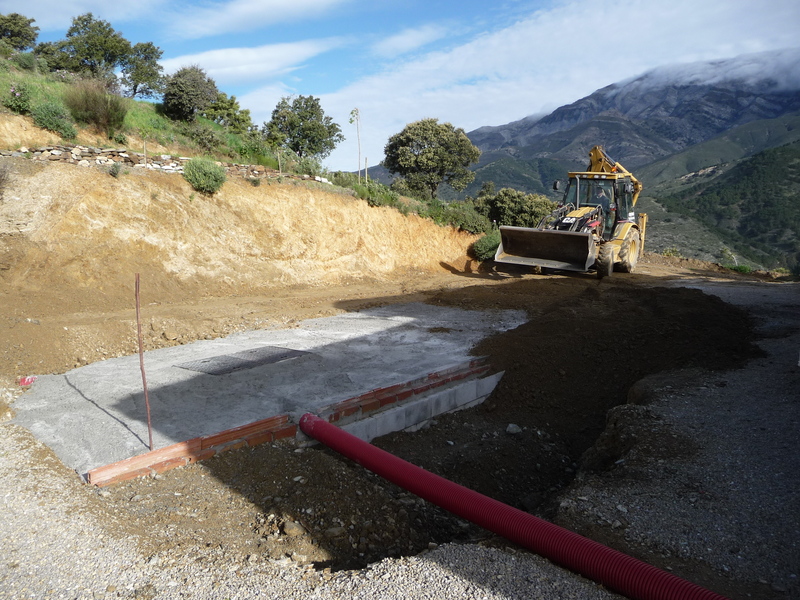 We have a huge 40,000 litre depósito under the car parking area alongside the house, which we had installed in 2010. 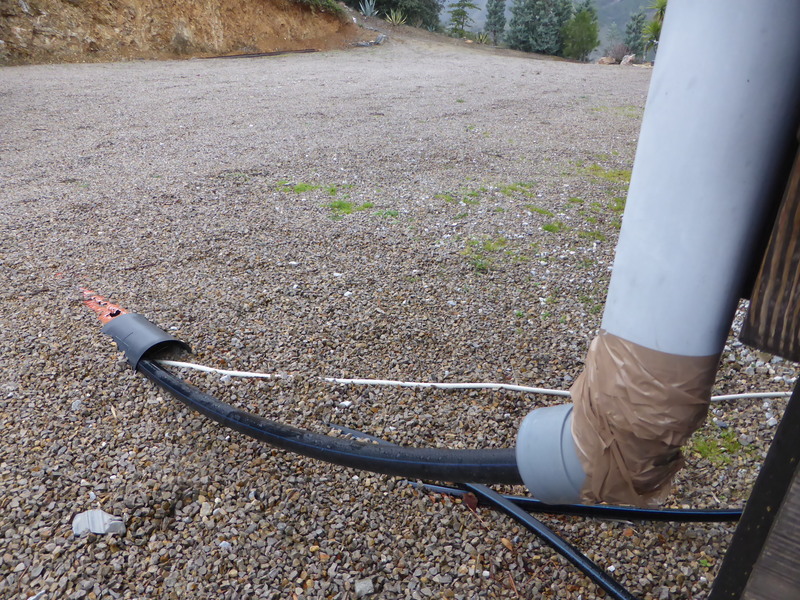 We use the little electric pump under the house (Joe has fixed the leak) to pump up water from the big one to the three 3,000 litre round depósitos on the high ground above us which by gravity supplies both the house and the irrigation system. We don’t use it as drinking water since the depósitos are not airtight or designed for that purpose. Since we arrived back, about ten days ago, we’ve used about 6,000 litres. In order to maximise the rainy season now, we need to fit proper guttering to the cabin but still haven’t got around to it yet. In fact, it’s rare to see guttering used around here. Yesterday, Joe rigged up a Heath Robinson structure to carry some of the water cascading off the extension roof directly into the underground tank. We’re the only house in the area without mains electricity and water and recently we’ve been approached to see if we want to contribute to a new water line coming directly from the foot of the mountain, about 1.2km away. Two neighbours have a problem with leaks in their existing pipes so a new trench will have to be dug for the two replacement pipes, and it will have to be done very carefully so as not to disturb the 16 other water pipes that feed other properties. Did we want our friendly digger driver Luis and his company to put in a pipe for us? What an enticing thought. Imagine, water on tap without having to fire up the gennie to pump up our own well water for household use and watering the plants! But we never thought it a hardship collecting the mountain water for drinking. Last year we had to spend 500 euro on tankers to bring in water when we ran out completely and the pump and generator both stopped working. I had to submit a few details to the ayuntamiento (town hall) in the village 5km away and they agreed to us having water. Yippeee! Next, Luis took me to our nearest ayuntamiento for the necessary permisos to dig a 200m trench from the neighbours to our house, then to request permission from the Junta to disturb earth on one of their sacred via pecuaria reales (it’s a sort of livestock track protected by royal decree). You’ve never seen such a carry-on. We were there for about 2.5 hours while the unsmiling clerk checked and double-checked dimensions, then went through my passport, NIE identification details, my council tax references etc. I signed three forms. She gave verbal permission, but we would have to wait for written permission, and in 2-3 months we would hopefully get the licence from the Junta. I felt unusually triumphant as I’d been quaking when I entered the ayuntamiento. Over the last four years we had been trying unsuccessfully to gain a similar permiso for either a trench to bury cables or pylons to carry them so that we could be hooked up to the national grid via Endesa, who had actually surveyed our land and given permission. Our application was halted at the gates of the ayuntamiento who merely said “it’s complicated”. We thought it was a human right to have electricity, especially as we are paying IBI – council tax. The luz (electricity) ‘problem’ reared its ugly head once more last year. On our return from the UK (on April Fool’s day actually), we saw a number of telegraph poles and mounds of gravel alongside our lower drive – just where we had asked for permission to put a pylon. 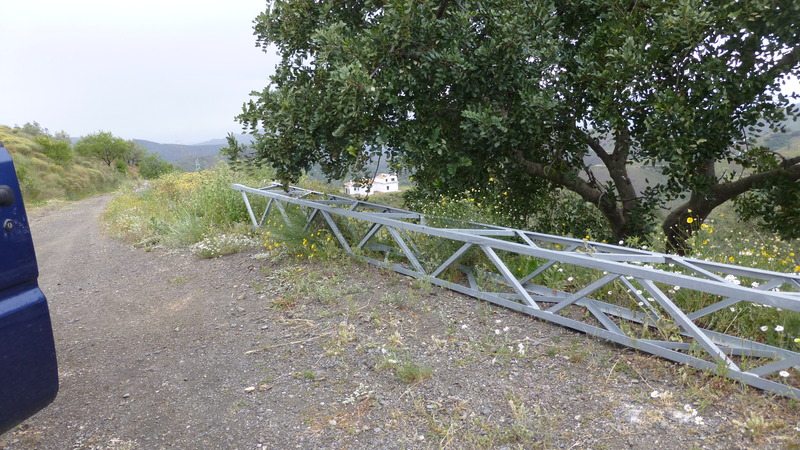 It transpired that a local Spanish gentleman who had built a house speculatively at the back of our hill had got permission for a private supply (via Endesa) and within 3 weeks there were live telegraph pylons stretched across our valley to the track below us and alongside it. So, what had been “complicated” for us, had been a piece of cake for him. We then tried a three-pronged attack via Luis, via our electrician, and via our friend Román – all of whom professed an intimate friendship with the lucky Spanish geezer. And here we are, no further forward. So you can’t blame us for feeling a little miffed. Anyhow, the water thing seemed to be a goer until we started getting down to the nitty-gritty. Luis couldn’t really give us any fixed price, because of so many variables – amount of sand needed; how many other pipes could be damaged during the excavations; whether one or both neighbours would contribute, etc. So it could be anything around 5,000 euro, then he couldn’t commit to how much it would cost us alone for the further 200m to our house. But it will be agua potable (drinking water), Luis stressed, by way of defence. Then there was the little matter of committing ourselves to the town hall, giving them my bank details and paying 1,300 euro for the contador (meter) before we had any final figures. No way José, as they say. I think we may pass on this, but it will be interesting to see whether the permiso does come in 2-3 months. 1 Response to No way José! Isn’t anything simple in Andalucía? Thankfully, there is so much else he to make the stay worthwhile. Phew!